Exactly one week, After her husband was convicted of sexual assault Camille Cosby is slamming his accusers and the media. And calling for an investigation into the prosecutor. Bill Cosby's wife called Thursday for a criminal investigation into the suburban Philadelphia prosecutor behind his sexual assault conviction, saying the case that could put the 80-year-old comedian in prison for the rest of his life was "mob justice, not real justice" and a "tragedy." "Once again, an innocent person has been found guilty based on an unthinking, unquestioning, unconstitutional frenzy propagated by the media and allowed to play out in a supposed court of law," she said. "This is mob justice, not real justice. This tragedy must be undone not just for Bill Cosby, but for the country." 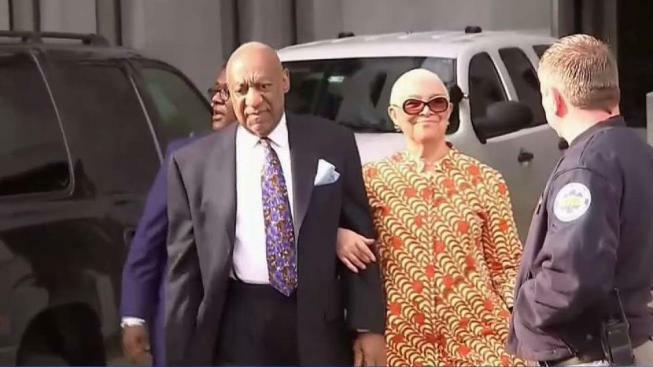 Camille Cosby, 74, said chief accuser Andrea Constand was a liar whose testimony about being drugged and molested at Cosby's home in January 2004 was "riddled with innumerable, dishonest contradictions." She echoed Cosby's lawyers, who contended that Constand framed him to score a big payday. "Twelve honorable jurors — peers of Cosby — have spoken," lawyer Dolores Troiani said. "There is nothing else that needs to be said." Constand said in a tweet last week that "Truth prevails." The jury said in a statement Monday that she was "credible and compelling." Prosecutors opposing a request for juror names from The Associated Press and other news media outlets urged a judge on Thursday to consider a "cooling off" before they're disclosed. They cited a 90-day wait in the case of Casey Anthony, the Florida mother acquitted in 2011 of charges she killed her young daughter. Camille Cosby stayed away from both of her husband's trials, except for the defense's closing arguments. She and Bill Cosby had five children — two of whom have died — and she served as his business manager. Before the jury came in last week to hear from Cosby's lawyers, she went to the defense table and put her arm around Cosby, who is legally blind. They embraced, smiled and chatted, and he gave her a peck on the cheek. When it was the prosecution's turn to argue, she left the courtroom, and Constand entered. Camille Cosby compared the dozens of other women who've accused her husband to a "lynch mob" spurred on by the media's "frenzied, relentless demonization" of the man who earned a reputation as America's Dad playing Dr. Cliff Huxtable on the top-rated family sitcom "The Cosby Show." "Someday the truth will prevail, it always does," Camille Cosby said. She said her husband's prosecution was politically motivated, repeating his team's contention that he had been a pawn in a heated race for district attorney. Steele's office declined to comment.